Photo (c) A. A. Evseev. Here we will examine "sal ammoniac," a common alchemical ingredient used by Antonio Neri in many of his early seventeenth century preparations. In its pure form, it is a colorless crystalline material and is known to chemists as ammonium chloride. It does occur as a (rare) natural mineral, but it was also manufactured as early as the thirteenth century, as noted by alchemist Albertus Magnus in his De alchymia. Neither he nor Neri provides a recipe for sal ammoniac, but other sources indicate that it was made by allowing urine to putrefy with common salt. French investigators documented another method used in Egypt in the eighteenth century. This scheme involved burning the dung of animals who fed on spring grasses and then sublimating the ammoniac out of the resulting soot. Sublimation occurs when a heated material goes directly from a solid to a gaseous state without ever becoming liquid. Sal ammoniac has this property; when heated it turns to a gas and upon cooling, turns back to a solid. 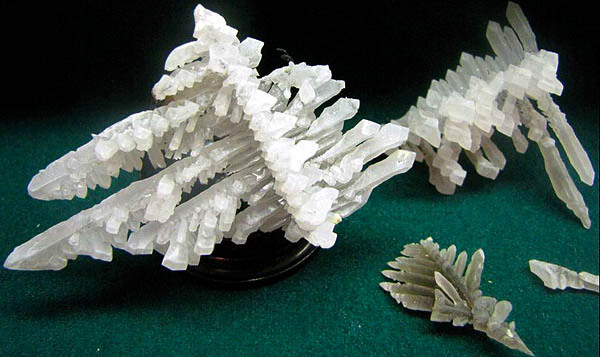 The usefulness of sal ammoniac in alchemy stems from the fact that when dissolved in water, which it does easily, it immediately dissociates into equal parts of ammonia and hydrochloric acid, which in turn will dissolve some metals, including tin, zinc, iron and (reluctantly) lead. Its most famous use was as an additive to the stronger acid aqua fortis (nitric acid). Together the two formed aqua regis which was strong enough to dissolve gold. At the time that Neri was working, the only known way to dissolve the most 'noble' of metals (gold) was with the 'king' of acids (aqua regis). Neri puts this knowledge to use in his recipe for ruby-red colored glass made with pure gold. His description is light on details, but he does clearly direct the reader to dissolve the precious metal in aqua regis, then gently evaporate away the acid to obtain the red pigment. 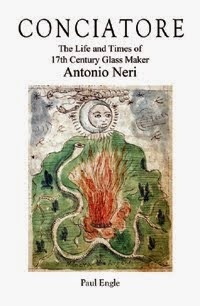 Elsewhere in Neri's glassmaking book, L'Arte Vetraria, he uses sal ammoniac in the production of "alemagna blue" paint and in the tinting of natural rock crystal. Another of Neri's creations requiring sal ammoniac was Chalcedony glass. It had swirls of every color the glassmaker could produce. He achieved this feat by making extensive use of aqua regis to dissolve a long list of metals. He then gently evaporated off the acid, leaving ultrafine powdered metals, which he added as pigments to the glass melt. With this powder, I made a chalcedony in a glass furnace in Antwerp that was then run by a most courteous gentleman; Mr. Filippo Gridolfi. This chalcedony gave rise to work so nice and graceful, that it emulated true oriental agate, and in beauty and delightful colors by far exceeded it. Today, chemical factories produce vast quantities of the materials used by Neri in his glassmaking exploits and in far higher purities. Having unlimited quantities of every conceivable chemical compound at our fingertips makes it difficult to appreciate the physical labor involved by seventeenth century alchemists, both in the preparation of the glass and in the production of the individual ingredients. The chalcedony glass recipe cited above must have taken workers many, many hours to produce and must have cost a small fortune. Glauber and others used the term 'sal ammoniac' to describe a related chemical (NH4)2SO4. When mixed with aqua fortis this forms a nitric-sulfuric acid solution, which does not form aqua regis, and does not dissolve gold. *This post first appeared here 22 August 2014.